Buckhead Betty ... on a Budget: Tis the Season! The idea of the holidays is also bringing up the idea of having to buy gifts. And buying gifts with a budget that is already tight (too tight, if you ask me!). So how do we approach this year, and show our loved ones that we care, without blowing any cushion in the bank account? Here in A-town, my immediate family has discussed (informally, for now) that this year will be the year of handmade and a-typical presents. My brother and I both have holiday birthdays, so it is extra-important this year to be considerate of budgets, but still make it feel special and personal and un-combined. For example, I have already suggested that my brother make me something to hang on the new red wall. This would totally cover both my birthday and Christmas, since its so heartfelt. He claims he is not a "painter" per se, but I know him and his intense creativity, and I know whatever he does, it will be perfect for the space. One of our mutual friends has even offered to help him, so that's resourceful. Plus, all I have given him is an idea, so the final product (whatever it is) will be a huge surprise. 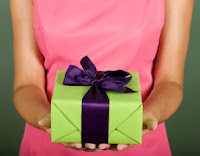 What little (or big) changes are you anticipating this year as you think about gifts for the holidays? The most important thing is that we get to spend time with our loved ones, of course, but its always fun to give and receive!